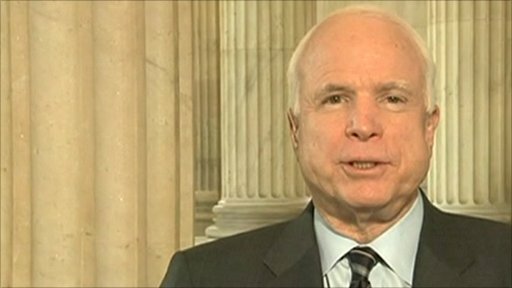 Republican Senator John McCain has called for a no-fly zone over Libya as a "first step" in tackling the "massacre" in the country. Speaking to Newsnight's Jeremy Paxman, Mr McCain said the world had "an obligation" to take action, and suggested that the arming of rebels should be considered as part of the response - despite a UN arms embargo. Mr McCain said that humanitarian and technical assistance should also be offered but that sending ground troops would be "counter-productive".